Dublin have beaten Leitrim in Carrick-on-Shannon in the second round of the Bank of Ireland All-Ireland senior football qualifiers on a scoreline of 1-13 to 0-04 in a very poor game. A brace of early frees from Michael Foley and a seventeenth minute point from Barry Prior had put the Connacht side 0-03 to 0-02 in front, but soon Dublin clicked into gear. Senan Connell had pointed twice, following a Seamus Quinn block down and from a 25-metre free and Tommy Lyons' side were level on 27 minutes through Tomas Quinn. St Vincents' forward Quinn, who had missed a touchline chance and a '45, right-footed over to square the game and the Dubs went in at the break 0-05 to 0-03 thanks to Quinn again and Alan Brogan. The second half was a cakewalk for the Metropolitans as they scored the opening seven points of the half, and their superior fitness told. Brogan set up Connell, Jason Sherlock evaded Michael McGuinness to point and Brogan himself, pointed on the run to open a five-point gap on 44 minutes. Quinn picked off his third, Bryan Cullen opened his account and all this before the biggest cheer of the afternoon was afforded to GPA chairman Dessie Farrell as he entered the fray on 53 minutes. The wily campaigner combined with Sherlock to point on the hour mark, with Leitrim substitute Fintan McBrien hitting his side's only score of the second half from a 30-metre free with seven minutes remaining. 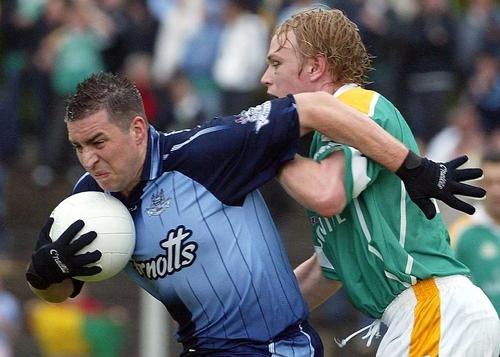 Salt was rubbed into deepening Leitrim wounds when Senan Connell finished off an injury time goal, adding to a Paul Casey point, as Dublin ran out easy winners. Leitrim: G Phelan; D Reynolds, S Quinn, M McGuinness; N Gilbane, P Flynn, C Regan; N Doonan, C Carroll; J Gantley, J Guckian, B Prior; J McGuinness, P Farrell, M Foley. Dublin: S Cluxton; B Cahill, P Christie, C Goggins; P Casey, D Magee, P Griffin; J Magee, C Whelan; D Lally, B Cullen, S Connell; A Brogan, J Sherlock, T Quinn.